This Wednesday was a glorious day for me. I got the (always thought it would be too far-fetched to think about it) possibility to go up two Canadian snow topped mountains to do some skiing! The local at Summit ski rental shop had offered me free equipment; the folks at the offices of Whistler-Blackcomb had provided me with a ski pass. So after a nutritious breakfast at the lodge Joern took me up to the Whistler resort (the lodge is more out of town, where the real Whistler people live) and we got into the gondola that took us up Whistler Mountain. Whistler has Whistler Mountain, and right next to it is another area of the valley called Blackcomb and there is Blackcomb Mountain. Anyway, the mountains are next to each other too. From one you can have great views on the other one and on the spring green village below. The last time I had been skiing was with my dad. It was end of March 2001 in France and there still was enough snow for that last week of the season. And now I was skiing in Canada! I would have never thought about that. A few months ago I was watching this travel show on television in The Netherlands, and one of the hosts was promoting holidays in Canada. We saw that lady on snow mobiles and on skis, parading through the snow with a big smile. And then I would have never guessed I would be doing exactly the same things two months later! Up on top of the mountain (live webcam!) at some 1520 metres high, Joern and I met up with the American guy Scott again. Scott is a good friend of the Rohde family and Joern had actually called him up in Seattle and asked to come over. Because the chances that Joern and Scott could actually meet up on a mountain for some skiing is very small. Today is the second time this winter season that Joern got a chance to ski himself. Jackie is now taking care of all the business at the lodge for a day. We skied down different slopes and enjoyed the great snow and the warm sun in the blue sky. Of course Scott had to put in some over-American-patriotic remarks whenever possible, he even sang the American anthem in the chairlifts going up! I couldn�t escape from it at all! After touring around on Whistler Mountain, we skied all the way down to the valley (just enough snow to get there!) and we went up on Blackcomb Mountain. Scott had already left back to the lodge (old men can�t ski long, he said) and suddenly it was so nice and quiet (hehe). Whistler is visited by lots of Americans. It is interesting because I can recognize them when they talk. Americans say the word about clearly, while the Canadians merely say aboot (the pronunciation differs). And (and I am really generalizing the Americans that visit Canada this time, sorry!) they say really world-strange things! Example: American buys something in a store. American pays money and gets change, then asks: �Is that in American dollars?� Sorry, but that�s when I have to clutch myself on something as fast as possible. I am rolling on the floor laughing, quietly of course. In a chairlift up the mountain we also sat next to a couple from New Jersey. They flew over all the way to spend one week of vacation up here. But they were good Americans, they did not make fun of Canadians, they did not sing the American anthem either! On Blackcomb Mountain we got over the top to the other side, where the Blackcomb glacier is located. This part of the mountain seems to close soon and then re-opens again mid-summer, so you can actually ski down the glacier in your summer shorts! And going down from the top of this mountain is a buzz! It is one of the longest runs down I have ever experienced! It is not just skiing down the glacier and into the valley again, but it is a 11 kilometres run! Wooha! After this whole day we got back at the lodge around 5pm and we were totally finished. Joern walked zigzagging and I walked half crooked. The best thing to then prevent tomorrow�s possible giant muscle pains was to spend some time with a cold beer in the outside hot tub! Now that�s a different kind of apr�s-ski! 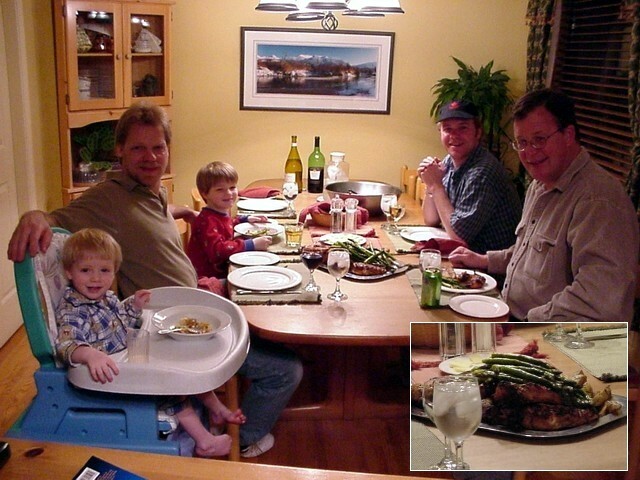 As Scott had come over for just a few days, he had taken the dinner ingredients with him, from Seattle. Joern and Jackie made nice asparagus and spicy chicken with potatoes strips for dinner. 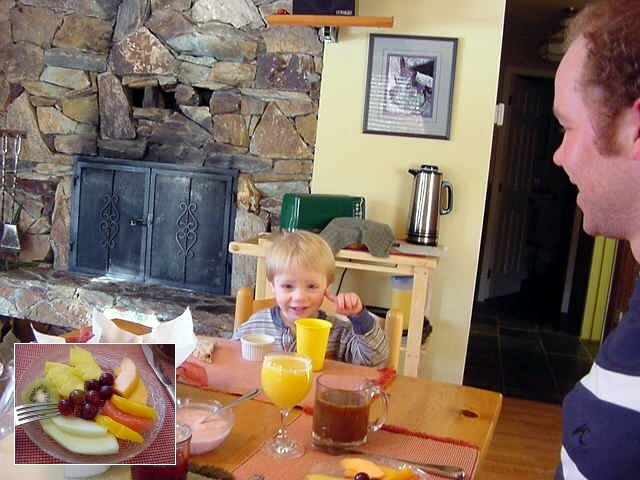 It was really good and I had a good relaxing time at this bed & breakfast lodge. The folks are nice, the kids entertaining (however I now have blue toes of Nikolas jumping on my feet all the time!) and the guests� pretty normal. Would I make it to bed early tonight? Yes, got to bed at 3am. Travelling with a website and committing to daily reports can be a hard job too, but I got to payback those freebies of the last days someway, don�t I?